Vascular access is the most commonly performed invasive procedure in medicine. For more than 20 years, ultrasound has been shown to improve the success and decrease complications of central venous access; however, it is still not universally used for this procedure. Ultrasound may also be used to facilitate difficult peripheral vascular access, potentially avoiding other more invasive procedures such as central or intraosseus vascular access. 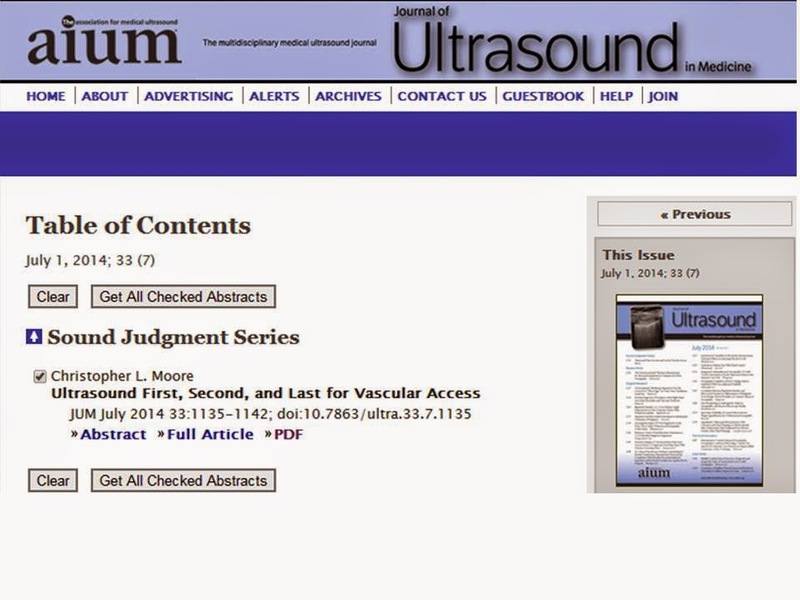 This article reviews some of the indications and evidence for ultrasound-guided vascular access, provides tips for successful ultrasound guidance, and discusses barriers to adoption. Revision received February 9, 2014. Objectives—Physical examination can identify palpable splenomegaly easily, but evaluating lesser degrees of splenomegaly is problematic. Hand-carried ultrasound allows rapid bedside assessment of patients. We conducted this study to determine whether hand-carried ultrasound can reliably assess spleen size. Methods—Patients with varying degrees of splenomegaly were studied. Two sonographers blindly measured spleen size in each patient using either a hand-carried or conventional ultrasound device in random order. Sonographers completed a data sheet indicating the adequacy of the image, clinical measurements of enlargement, and confidence in their observations. Results—Sixteen patients (10 male and 6 female; mean age ± SEM, 60 ± 4 years) were recruited. Image quality was adequate or better in all scans with conventional ultrasound and in 15 of 16 scans with hand-carried ultrasound. The greatest longitudinal measurement recorded was statistically equivalent across ultrasound techniques, with mean values of 16.4 cm (95% confidence interval, 14.8–18.0 cm) for conventional ultrasound and 15.8 cm (95% confidence interval, 14.1–17.4 cm) for hand-carried ultrasound. The correlation between measurement techniques was r= 0.89 (P < .0001). Sonographers were somewhat or very confident in the outcomes of all scans with conventional ultrasound and in 15 of 16 cases with hand-carried ultrasound. In general, it took longer for sonographers to obtain images with hand-carried ultrasound. Conclusions—We have shown that hand-carried ultrasound can be used at the point of care by trained individuals to diagnose splenomegaly. However, hand-carried ultrasound images were less likely to be judged excellent, were accompanied by less diagnostic certainty, and took longer to obtain. This report documents 3 pediatric papillary thyroid carcinoma cases with associated Hashimoto thyroiditis. In all 3 cases, hypoechoic nodules accompanied by multiple echogenic spots were noted on sonography of the thyroid. Hashimoto thyroiditis was suspected on the basis of positive thyroid autoantibody test results and pathologic examinations of thyroidectomy specimens, which revealed chronic thyroiditis with lymphocytic infiltration as the background of papillary thyroid carcinoma development. The potential for papillary carcinoma development warrants close follow-up, and meticulous sonographic examinations must be performed in children with Hashimoto thyroiditis. Revision received August 22, 2013.